A trip to the state of Washington is incomplete unless you book flight tickets to Wenatchee. This is the largest city of Chelan county. The city is full of amazing spots for tourists to explore. The city is situated at north-central Washington. The city has been named after Wenatchi Indian tribe that resides nearby. 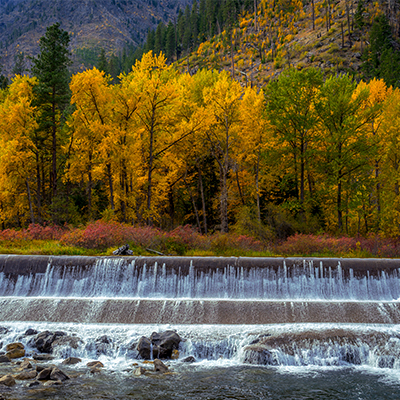 Wenatchee, the city, shares its name with the Wenatchee River, Lake Wenatchee and the Wenatchee National Forest. One of its nickname is “Power Belt of the Great Northwest”, after the fact that it contains a series of hydroelectric dams that has been built over Columbia River. The Riverfront Park- If you want to enjoy the serene vibes of Columbia River, then you must visit Riverfront Park. This lush green park gives you a beautiful view of the river. The hills around it add charm to the scenic view. The sunrises and sunsets are also worth your time. The trails beside the river are perfect for you to stroll around in. You can also go cycling while visiting the park. The park also features a number of compelling sculptures. It is the perfect place for a lovely picnic with your travel-buddies. Ohme Gardens- A beautiful piece of nature, the Ohme Gardens is often used as a wedding venue. Groups of people visit the park to practice yoga, breathing-in that fresh air. The gardens have been named after the Ohme family that initially developed the place turned it into the luscious garden it is today. These gardens are equally loved by both — tourists and locals. Home to numerous little wildlife creatures, it is also where bird-watchers gather every once in a while. Apple Capital Recreational Loop Trail- This is a 10 mile long stretch on the sides of the Columbia River. The stretch features numerous parks and trails which makes it a great place for cyclists, joggers and skaters. Wenatchee Youth Circus- The live-circus in Wenatchee is a real treat to your eyes. The best part about the shows is that they are performed by the kids of the city, after a series of workshops; where they learn how to perform these acrobatic feats. Pybus Public Market- Pybus Public Market is located adjacent to the 10-mile-long Apple Capital Recreation Loop Trail along the Columbia River. The market has a number of charming bristos where you can unwind after a couple of hours of browsing through fresh-produce. You will find more than 45 vendors selling fruits, vegetables and other organic products that are grown in the valley. Martin Scott Winery- This famous winery allows you to taste more than 17 different types of wine. Travelers need to visit the winery on a Saturday if they plan to go for wine tasting. Cheese plates and breads are available during tastings. You can buy wine bottles on affordable prices from this winery. You can also enjoy breakfast/dinner at one of 3 different patios while enjoying a view of the local orchards, Mission Ridge ski area and Malaga Springs Winery. You can see the snow on Mission Ridge until mid-June when Martin Scott Winery organize Thursday-night dinners on the patio. You can also learn about the wine-making process. If you are looking for cheap flight tickets to Wenatchee, then Lookupfare is exactly what you need. We offer the widest range of cheap flight deals that suit your travel budget. Go through our easy-to-navigate website or download our app to find the flight deals that meet all your travel requirements.